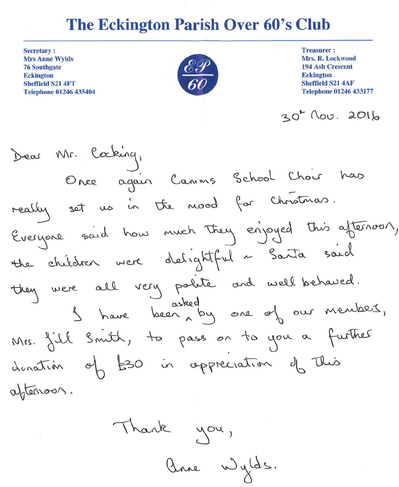 On Wednesday 30th November the children from our choir did their annual visit to the Over 60's club in Eckington to sing Christmas Carols and songs to help to get them in the mood for Christmas. They were rewarded with a visit from Santa and a selection box. Each and every year the committee kindly make a donation to the Choir which helps to support the annual Choir coach trip costs to Young Voices in January. A special thanks to a member of the club who donated an extra £30 to the choir this year. Thank you and the choir enjoyed the practice ready for their big performance at Young Voices in January.